My first scientific book was just released. Exploring… is a revised and expanded version of my master thesis, it starts from the reflection that social networks are commonly seen as a technology used only for entertainment. However, they can also be used for serious purposes in business and education environments, as they are powerful tools that can accomplish various roles and purposes. This book presents research done from an information science perspective; where the researcher took as a starting point and expanded on the issues presented in Bawden & Robinson’s The Dark Side of Information (2009). Presented with this book are extensive transcripts of the interviewed students and academic staff of a master course, who were asked about the issues of Web 2.0 and social networks identified in the literature, along with the typical features or characteristics of social networks. 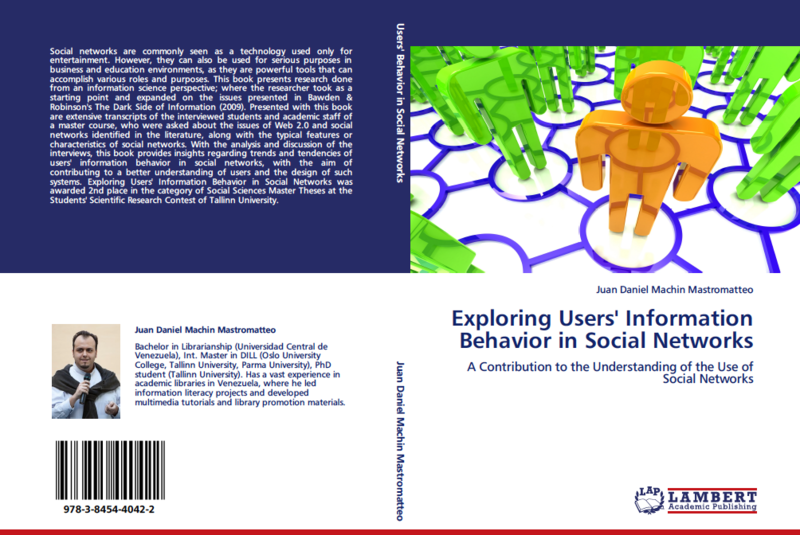 With the analysis and discussion of the interviews, this book provides insights regarding trends and tendencies of users’ information behavior in social networks, with the aim of contributing to a better understanding of users and the design of such systems. Exploring Users’ Information Behavior in Social Networks was awarded 2nd place in the category of Social Sciences Master Theses at the Students’ Scientific Research Contest of Tallinn University. In the back of the book, as required by the publisher, there is an extremely short info about me: Juan Daniel Machin Mastromatteo, Bachelor in Librarianship (Universidad Central de Venezuela), Int. Master in DILL (Oslo University College, Tallinn University, Parma University), PhD student (Tallinn University). Has a vast experience in academic libraries in Venezuela, where he led information literacy projects and developed multimedia tutorials and library promotion materials. By judamasmas in Research on 2011/09/13 .